Philip Hancock is a Professor of Work and Organisation at Essex Business School at the University of Essex. Before joining Essex Business School he was an Associate Professor at the University of Warwick. His academic background is in theoretical and qualitative sociology, and he holds an MA in Philosophy and Social Theory from the University of Warwick and a PhD from Keele University. 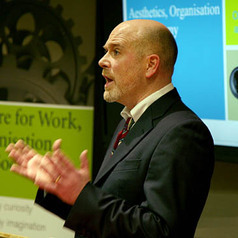 His research interests include practices of organisational aestheticisation, the architectural management of space and place, practices of interactive service work and, in particular, the production and reproduction of socio-economic and organisational relations at Christmas. He has published widely in leading journals in the field of organisation studies and sociology and has published the books The Body, Culture and Society: An Introduction (Open University Press), Work, Postmodernism and Organization: A Critical Introduction (Sage), Art and Aesthetics at Work (Palgrave), Understanding Corporate Life (Sage), The Management of Everyday Life (Palgrave), Work and Organization: The Aesthetic Dimension (ISCE). He is a member of the editorial boards of Organization Studies (Sage), Organization (Sage) and Work, Employment and Society (Sage).